"Orca" redirects here. For other uses, see Orca (disambiguation). 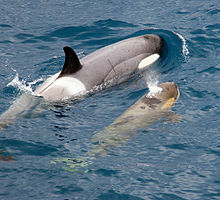 For The Avengers episode, see Killer Whale (The Avengers). 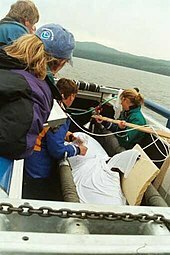 Although the term "orca" is increasingly used, English-speaking scientists most often use the traditional name "killer whale". Indeed, the genus name Orcinus means "of the kingdom of the dead", or "belonging to Orcus".Ancient Romans originally used orca (pl. 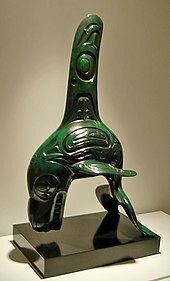 orcae) for these animals, possibly borrowing Greek ὄρυξ (óryx), which referred (among other things) to a whale species. 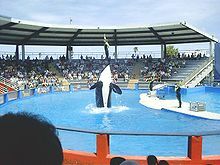 Since the 1960s, "orca" has steadily grown in popularity. 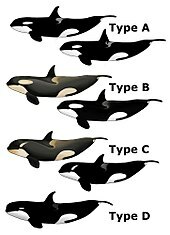 The term "orca" is euphemistically preferred by some to avoid the negative connotations of "killer", and because, being part of the family Delphinidae, the species is more closely related to other dolphins than to whales. 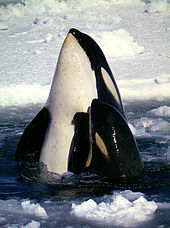 Look up killer whale in Wiktionary, the free dictionary. Wikisource has the text of the 1911 Encyclopædia Britannica article Grampus.